Uncycloversity is a place for the severe and unrelenting abuse of your brain. The project is devoted all styles of misinformation, from pre-school toilet humor to university toilet humor. We invite all teachers, students, researchers and anyone else who probably has something more constructive to do to join us in creating scatological one liners in this collaborative, time-wasting community. Help destroy Uncycloversity with cheese! Mottos and slogans - Help prevent a definitive motto or slogan for Uncycloversity from ever being chosen. Hate the way this page looks? - We sure do! Complain bitterly on the talk page. Worthless Projects encourage passive mental deterioration. Policies - Help make our policies as unfair and incomprehensible as possible. Visit our Communist Pork Hole. Colloquium - Ask a stupid question about Uncycloversity. No-help desk - Ask a stupid question about anything. 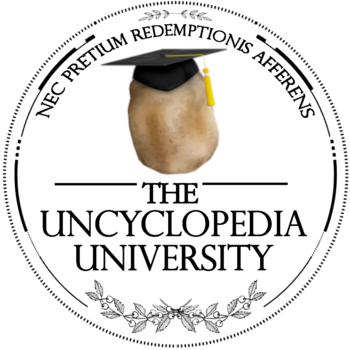 Immature Reprobates Complaining: Get "booted" by us on #Uncyclopedia (on Freenode). Mailing List: Uncycloversity-L Please subscribe to the list or view the archives. Drunken Driving - How Uncycloversity can swerve, weave in and out, fall asleep at the wheel, and cause multi-vehicular collisions. Abusiveness - How Uncycloversity can ruin your life. We Serve Communism! - How Uncycloversity can serve free drinks to communists. Free Money! Scholarship! - How Uncycloversity beats the government, we give you FREE money so you don't have to succumb to The Man. This Uncycloversity is only written in Engrish. This is the only language we know, because we are not properly edumacated. If you are, go get you printable and customizable diploma here. This page was last edited on 1 August 2018, at 18:00.